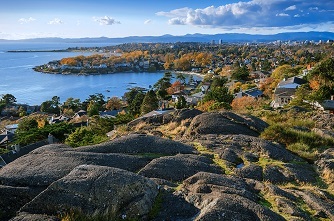 Oak Bay, the Most Coveted Municipal District in Greater Victoria. 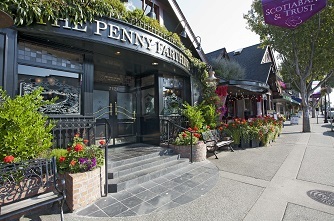 OAK BAY is currently the most sought after district in the region, with it's many luxurious turn of the century character houses, elegant town homes, and condos, manicured lawns, tree lined boulevards, and it's generously landscaped oversize lots. Nestled away from busy transportation corridors, and in very close proximity to the water, Oak Bay offers a quiet neighborhood ambience, very little traffic, and plenty of fresh air. The housing stock is generally of superior quality, and in superb condition, with nothing in the way of industrial or heavy commercial activity to disturb the peace, while still offering enough in the way of conveniences and amenities to cater to the upscale tastes of it's conservative, mostly older professional, often retired, and generally more affluent population. The Oak Bay Ave neighborhood village is the most substantial and varied of it's kind in the city, offering everything from a bakery, to a high end organic butcher, a pharmacy, and an English style pub for those who wish to have a few pints without getting busted for driving under the influence by members of Oak Bay's own police force, some of whom have been known to drive while inebriated themselves, occasionally. Major shopping is available via the Fairfield Plaza shopping center, close by, or the Save on Foods center, that also features the most well stocked liquor store in the city, catering to Oak Bay's many wealthy boozers. 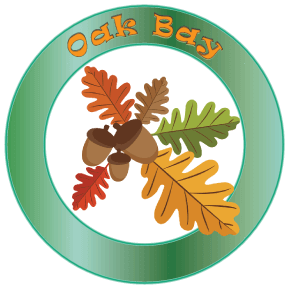 The history of Oak Bay is also interesting and dates back to the late 1800's when Oak Bay was a collection of large farm acreages. As a result of railroads and tramways, mooted and operating, houses were in the early 1900's going up everywhere, not only in Sidney but in Esquimalt, Saanich and in Oak Bay which had been previously a reserve for the summer homes of the better-to-do. The Greater Victoria Muncipalities were incorporated in these years, Esquimalt in 1912, Oak Bay and Saanich in 1906. One of the biggest landowners was Joseph Despard Pemberton who owned a large part of Oak Bay, the Gonzales district (including Gonzales Heights) and Fairfield (see map). Fairfield Road was put through in 1857. Joseph Despard was an outstanding example of an immigrant who combined an official position with an eye for future land values. He had to wait a long time but made his fortune in the end. Like so many of our pioneers he came from Ireland where opportunities were few in the depression which followed the hunger years. With Joseph Despard opportunities may have been fewer than average because his grandfather, a mayor of Dublin, had 18 sons and three daughters. Such large families were a main cause of the starvation which followed the failure of the potato harvests. Pemberton arrived here in 1851 as a surveyor for the Hudson's Bay Company and after undertaking on their behalf many dangerous missions in the Interior, bought in 1858 a five-acre plot, the nucleus of his Gonzales estate, known then as Pemberton Farm. Joined by his sister in 1856, Joseph Despard went to England, got married and lived with his wife in a 30-foot by 20-foot log cabin on the north side of Fairfield Road. Frederick Pemberton put through Oak Bay Avenue at his own expense. It was a move of enlightened self-interest as the road also gave better access to the Pemberton holdings. The potentialities of Oak Bay as a residential area were seen as early as 1891 when the Oak Bay Land and Improvement Co. was incorporated with 3,000 shares of $1.00 each. Shareholders included Major Dupont of Victoria, two big timber operators and John Paterson of New Westminster. Biggest owners of property in Oak Bay were the Hudson's Bay Company, who owned 1,118 out of the municipality's 1,922 arable acres; next came John Tod (407 acres), Wm. Henry McNeil (200 acres), Joseph D. Pemberton ( 188 acres) and Isabella Ross ( 10 acres). The single-storey dwelling of John Tod, a Hudson's Bay employee, still stands at 2564 Heron Street in Oak Bay. Its low doorways and undulating floorboards are typical of the carpentry of the 1850's. John Tod's acreage included Mary Tod Island. Mary married John Bowker and her home still stands in Bowker Place, which was on her father's property. The fine trees along 1900 block Beach were planted, it is believed, by John Bowker. Mary Tod Island is sometimes called Jimmy Chicken Island. An Indian named Jimmy Chicken lived on it at one time. Whether he was so named because he kept chickens, sold chickens, looked like a chicken or was "chicken" is not revealed in Oak Bay's history. Nor does Jimmy Chicken appear in any national biographies. In any case he must have had a very pleasant location with an island all to himself until Rattenbury, son of the architect, whose house (now Glenlyon School) was on the mainland opposite, built a swimming pool there, the remains of which can still be seen. John Tod is often referred to as a Hudson's Bay "factor," but people seem to have been rather free with high-sounding titles in the early days. In fact John Tod was very disillusioned with the Hudson's Bay Company. Like most of our pioneers he came from a poor family, lost his job in a Glasgow grocer firm and enlisted with the fur company for £ 20 a year. In his diary he refers to some of the hardships he suffered including meals on the emigrant ship which at first consisted entirely of porridge ( without milk or sugar) . The captain improved the diet only when some passengers swam ashore rather than endure it any longer. He served in several very unpleasant Hudson's Bay forts (or warehouses) before coming to the coast and frequently complained of the slow promotion in the Company's service. He had four wives at different times, but little is known of numbers one, two and four who were Indian. His third wife was from Wales. He bought his land in Oak Bay from the Company and ploughed up 100 acres which included Willows Farm. Rumor has it that some very lively parties occurred in his Heron Street home and that there was a tunnel from the house to the beach through which he smuggled in Chinese who at that time were subject to a head tax. His hardships and four wives do not appear to have done him any harm for he lived to the ripe age of 88, dying in 1882. Bowker Creek used to be called Tod's stream. Wm. H. McNeil, who owned 200 acres with Shoal Bay as the shoreline, was captain of the Hudson's Bay Company S.S. Beaver. He had a large farm running to the shore, which used to be known as McNeil Bay. Isabella Ross, by the way, who owned 10 acres, was a daughter of McNeil. The map in annex shows the boundaries of these properties imposed on a current map of Oak Bay. North of Oak Bay, McKay owned all of Ten-Mile Point and W. F. Tolmie, whose farm was at Cloverdale and North Quadra Street, owned 1000 acres bounded on the northeast by Mt. Tolmie, joining with the Work property on Hillside. 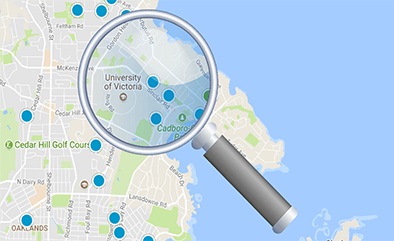 Click below to view Real Estate listings and properties in Oak Bay, and to search, browse, save, and view, homes, houses, town-homes town-houses, and condos for sale on MLS ® in Victoria.